Democratic representatives Mark Pocan (Wisc. ), Pramila Jayapal (Wash.), and Adriano Espaillat (N.Y.) introduced a bill Thursday evening to abolish U.S. Immigration and Customs Enforcement (ICE). The bill, the "Establishing a Humane Immigration Enforcement System Act," does not actually outline the details of what rolling back ICE would entail or what a replacement would look like. Rather, it creates a Commission to "Study and Establish a Fair and Humane System of Immigration and Customs Enforcement," responsible for bringing to Congress a proposal to abolish ICE within six months of its first meeting. The commission would be composed of 17 members: eight selected by members of Congress and nine appointed from "the major civil society and immigrants' rights organizations and individuals directly impacted by ICE practices." Such a group would be likely be made up of individuals strongly sympathetic to Democratic and left-leaning policy proposals. The commission is given little guidance in how to redesign ICE, with the bill stipulating only that those functions of ICE that comport with the Constitution and international human rights law be incorporated into some other agency, based on an agency's fitness and track record of transparency and compliance with Congressional oversight. Much of the bill is given over to a section on "findings," in which Pocan and his colleagues make their argument against ICE. "Numerous Federal oversight bodies, including the Government Accountability Office and the DHS Office of the Inspector General, have documented a disregard for congressional oversight and substandard conditions and inhumane treatment of those in ICE detention, which contravene ICE's own standards and Federal and international legal protections. In addition, other credible reports indicate violations of due process, and noncompliance with international and domestic legal protections. ICE detention facilities fail to meet ICE's own standards and have no meaningful oversight," the bill claims. It further claims that "removal operations tend to focus on individuals who are being prosecuted simply for illegal entry or re-entry, have no other criminal history and pose no threat to national security." The nonpartisan Pew Research Center found that the overwhelming majority of immigrants apprehended by Enforcement and Removal Operations had past criminal convictions: 74 percent in 2017. A representative of ICE did not respond to a request for comment in response to Pocan and his cosponsors' allegations about the agency. Although the much-promised bill has finally been released, it still leaves in the dark those who would like to know what the left intends to replace ICE with. Although calls for abolition have spread among the Democratic party's leaders—including potential 2020 candidates Sens. Elizabeth Warren (Mass.) and Kirsten Gillibrand (N.Y.)—none has put out a concrete plan of the sort the bill's committee would be responsible for producing. 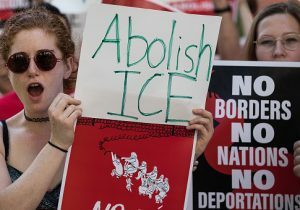 This may prove problematic for Democrats, as ICE abolition is unpopular: A recent Politico poll found that just 1 in 4 respondents backed the proposal, while a solid majority opposed it. While bare pluralities of Democrats and Hillary voters backed abolition, nearly as many opposed the proposal as supported it. Indeed, the bill's own authors may know that their proposal is politically toxic. Republican House leadership announced Thursday that they would allow Pocan et al. 's proposal to be brought to a vote, only for Pocan, Jaypal, and Espaillat to respond that they would not vote for their own bill if introduced, accusing House Speaker Paul Ryan (R., Wisc.) of orchestrating a political stunt. "Democrats have been trying to make July 4th about abolishing ICE, which is a radical, extreme position that would lead to open borders and undermine America's national security. I think it's the wrong approach," House Majority Whip Steve Scalise (R., La.) told the Hill. "I think everyone ought to be on record about where they stand on that issue."